To join two localities in the jungle of the Republic of Peru, the author had to travel as a passenger in a truck load of people and goods. The poor state of road and weather conditions made the journey a little difficult. This allowed him to meet interesting people and aspects of geography. In the village of Mazuko, in the jungle of the Republic of Peru, watched the falling water warning that the rainy season had begun. This complicated my plan to reach the city of Puerto Maldonado Peru also. While one hundred and fifty miles separating me from my destiny did not seem significant, the state in which they found they were. For hours I waited for a truck, almost the only means of transport between the towns named, no luck. 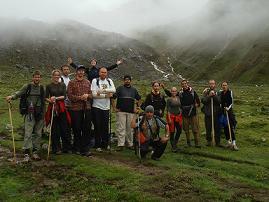 The villagers believed that some difficulties have begun to manifest in the road coming from Cuzco on account of rain. Tired, I decided to look for accommodation. The modest hotel room where I stayed was clean and fresh. When the electric generator stopped working people at the same time every day, I was resting. The wooden walls let in the sound of the raindrops rattling everywhere. With this it was difficult to sleep. The next morning I learned that a truck was about to leave and I hurried to find him. It was a Volvo N 1020, appeared to be very robust. In this area, both trucks are transporting cargo and people. So I went for a large group of people, up from sacks of potatoes, cabbage, general food and general merchandise. Accommodation as we could and prevailing comments on the time it would take to arrive. Until after closing business deals were continued and new packages are crowded into the vehicle. In these places, prices vary greatly with the kilometer, which is why each person a lot of luggage. Walking distance to sell everything and a handful of Suns, which is the Peruvian currency, light a little personal savings. Previous police checkpoint, leaving behind the people of Mazuko. The jungle surrounded us and then the road began to be difficult. Surprised, I noticed that in every shaft or slope the truck is leaning considerably. Its creaking wooden box with the torque suffered. I realized that the trip would not be quiet. My colleagues commented that it is normal for tipping lorries leaving good number of injured or dead. I think of all the passengers, I was most worried me. Others supported it with the tranquility that comes from the habit. For them, this form of travel, was normal. For me, sharing the social life in the truck was an interesting experience. As you saw, each had won a place among the cargo. This space used to be respected won by others. If not so, the owner defended him shouting, elbowing and discussions. To these people I was a stranger. They called me “gringo”, a term with calling abroad and which was used with a derogatory tone. For many of these people I was European, American, African or Argentinian was more or less the same. It was different in many ways to what they were accustomed. For this reason and the natural curiosity of the human being, I was constantly questioned, taking on some occasions, to answer the same question several times. My team was highly scrutinized, but still sleeping or at different times I left the group, nothing was stolen from me. He was also constantly tested. I asked for something borrowed, teased me and occupied my place to see and react. I actually sought to know what my limit. In some cases, they are clearly marked, but always trying to maintain harmony.